What does this mean for you? Warm beach parties, hot sizzling barbeques, lusciously green hiking and camping trips. Summer is the season of moving and grooving. But is it healthy for your skin? Let’s find out! While you do get ample of opportunities to soak in the Vitamin D, you also become an easy target for the harmful sun rays! These rays can burn you red and damage your delicate skin. But is it enough? Nope. In order to stay radiant and glowing in the sweltering summers, you need a good skin care regime. One that is free of chemicals and full of natural plant-based ingredients. So, that you are healthy and happy from head-to-toe. According to summer skin care 101, sunscreen is your lifeline. Lather yourself with this protected layer so your skin is able to deflect the UV rays when they attack. Then lock up the nutrients by using a good plant-based moisturizer. The deadly combo of sunscreen and moisturizer is the perfect shield to defend your skin from damage and skin burns. The common misconception about lips is that they only dry out in winters. However, this isn’t true. Our lips are the most delicate features of our face. Yet, when the sun starts shining we don’t always pay attention to them. Your lips have a tendency to get chapped and dry in the summers too. This is why it is important for you to use a lip balm to keep them soft and supple. While you are tanning in the heat you are also absorbing some free radicals. These harmful radicals get soaked inside the skin and cause chaos. They are also known to accelerate the aging process, yikes! Want to steer clear of age spots and wrinkles in the near future? Apply some antioxidants to shield your skin from UV rays and their dangerous friends. A good diet is mandatory for healthy skin. Try to eat a healthy dose of fresh veggies and fruits available during this season. Other than that, you can use them to put on your face. Yes! Feel free to use some refreshing cucumber masks and rejuvenating tomato scrubs to get a radiant skin. Isn’t it cool that Mother Earth provides just the right veggies when you need it. Apart from your seasonal essentials do not forget to keep your water bottle at hand. Hydration is the key that stops you from withering away in these soaring temperatures. Other than that we suggest that the products you use should be plant-based. This is because their natural ingredients do not strip off the nutrients and vitamins from your skin like their chemical-counterparts. Now, grab your sunglasses and beat the scorching heat! 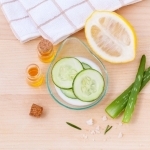 DIY Face Spritzers – How to Make Them and Why Are They Important? 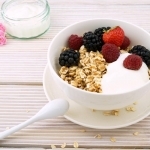 Colloidal Oatmeal vs. Your Mom’s Oatmeal: Which Is Better?